accolades | MND GMZ MINISTRIES: Reclaiming the Rules, Finding Identity in Christ. MND GMZ MINISTRIES: Reclaiming the Rules, Finding Identity in Christ. Hi. My name is Karen. I’m an approval addict. Well, at least I was. I like to think I’m in recovery now. My addiction began at an early age. As the story goes, as a toddler I would begin to cry if my parents even looked at me wrong. Whether two, or twenty-two, I desperately wanted my parents’ approval and accolades (along with everyone else’s). And I certainly didn’t want to disappoint them or anyone else either. There are many problems with seeking self-worth in accolades, or what others say about you. For one thing, the words never last. You end up needing more and more to feel secure. Seeking the approval and praises of others truly becomes an addiction when you can never have enough. Secondly, it is unrealistic to think that others will always sing your praises. You’ll likely make a bad decision and get in trouble. You’ll do poorly on a school or work project and be spoken to by your teacher or boss. You’ll let an easy grounder go right through your legs and here your teammates and coaches groan. And no matter how hard you try, there will be that one person (if not more) that just doesn’t like you for apparently no reason at all. Seeking approval and fearing disappointment or anger of others can lead to boundary problems and an inability to say no or express your own opinion. 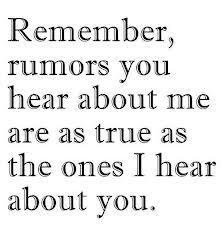 And finally, what happens when someone spreads a nasty rumor about you? Defining yourself by what others say really doesn’t work when what others say isn’t positive or true. Unfortunately, I think most of people have had this happen. I know I certainly have. I broken friendship led to the other person spreading horrible and untrue rumors about my character among our other friends and community. Had this happened to me in high school (thankfully it did not), I would have been absolutely devastated and would not have known how to handle it. Thankfully, when it did occur, I had a better sense of self and wise advisors to guide me in how to respond, which largely meant not responding at all and allowing my actions and character to speak for me. Yes, I was hurt, but I was devastated like I would have been in the past. When we search for self-worth in accomplishment, accumulation, or accolades, we are often left with regret. We are left unsatisfied and longing for more. All we can focus on is all of the ways we aren’t enough and we give power to things and people that do not really deserve to have it – like the grade on that paper or a new gadget we’ve purchased or what some peer says about us. When end up feeling insecure and acting in selfish ways. That’s the problem. Future blogs are going to focus on the solution. But tell me, does this resonate with you? How do you define yourself? Where do you look to find self-worth? Accomplishments? Accumulation? Accolades? Regrets? And when you look in those places, what do you find? Are you satisfied or left longing for more? Dr. Karen Cleveland is the founder of MND GMZ Ministries, an organization committed to proclaiming the truth about Jesus and reclaiming the rules to finding true identity in Christ. Dr. Karen is passionate about sharing the truth that our identity as a beloved child of God is found in Christ alone and not in the things of the world. Karen earned an MA in Theology and a Ph.D. in Clinical Psychology from Fuller Theological Seminary in Pasadena, CA. She currently resides in Pella, IA. She is a lecturer at Central College, where she is also a proud alum, and maintains a small clinical practice at Pine Rest Christian Mental Health Services.